Intertops Poker Review 2019 - Bonus Of Up To $1000 FREE! Intertops Poker is tested and approved! Visit Intertops Get your $1,000 bonus! Intertops Poker is still one of the biggest and highly regarded online gambling companies. Fully licensed and regulated. Incorporated and licensed in Curacao, Netherlands Antilles, Nicosia and Cyprus. Intertops Poker also promotes responsible gambling and the software has been tested and certified by Technical Systems Testing (TST). Fast, Reliable Withdrawals in about 5 days - many done instantly. ? All legitimate, real-money poker sites like Intertops Poker have strict anti-fraud screens, and that may create a short withdrawal delay. Make your first deposit and Intertops Poker will match it 200% up to $1000, so deposit $100 and they'll give you 200% deposit bonus. You earn your bonus simply by signing up, making your first deposit and playing real money games. ? Take advantage of Intertops Poker special bonus offer for new customers. Please read the terms and conditions carefully. 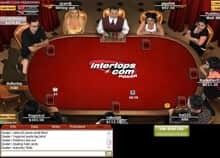 While it may not be the first name that comes to mind when you are thinking of major online poker sites, Intertops certainly has its place in online poker history. Originally founded as a sportsbook in 1983, the site can lay claim to being the very first site to accept online wagers back in 1996. 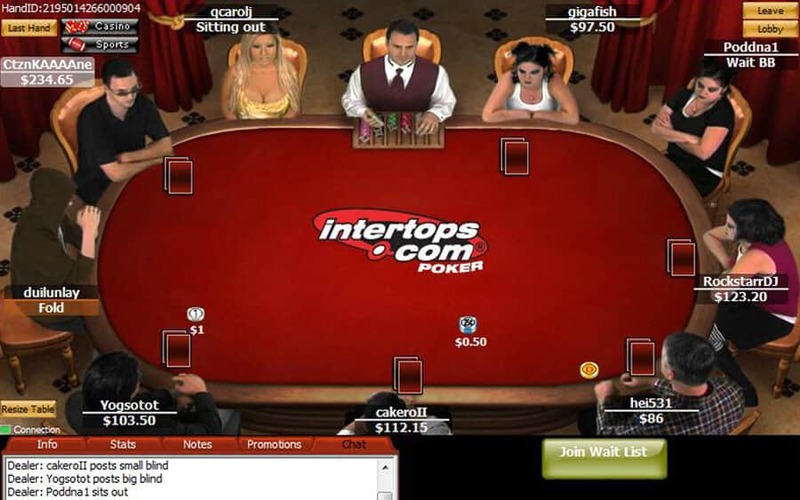 When online poker began to surge in popularity in the early 2000s, Intertops was part of the PartyPoker Network for several years before switching over to the Cake Poker Network of which it is part of today. Intertops is also well known for being home to soft games filled with plenty of fish (crossovers from the attached online casino and sportsbook) and its low buy-in high-reward satellite qualifying tournaments. Based in Curacao and the Netherlands Antilles, Intertops is also noted for its acceptance of U.S. players. If you don't need an abundance of fancy poker formats to keep you happy, then you will appreciate Intertops' simple selection options. Hold 'Em, Omaha, Omaha Hi/Lo, 7 Card Stud, and 7 Card Stud Hi/Lo are all offered, and within most of those you will see turbo and bounty tournament variations. The software client is offered as a standalone downloadable client (Windows only) and can also be played directly in your browser (Mac and Windows). Currently, a dedicated mobile app does not exist. 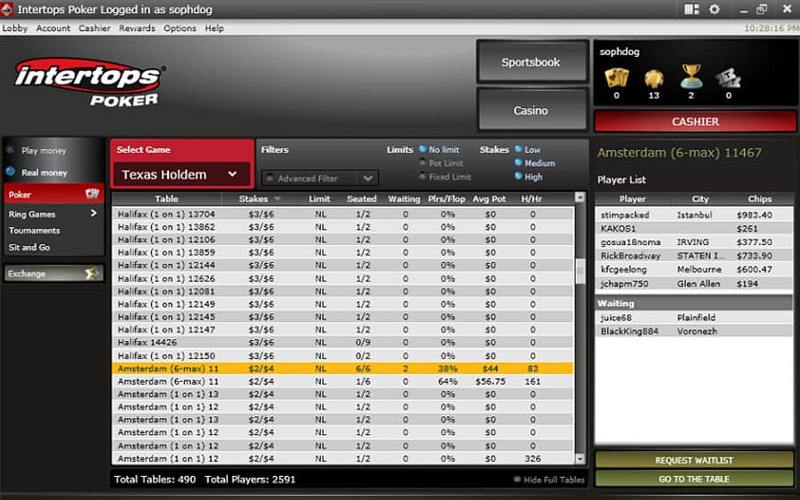 Intertops' Cake Poker Network software isn't the most eye-catching on the market, but it gets the job done and has a well-organized interface so that you can find what you are looking for, quickly. The in-game screen uses "real" player images (as opposed to avatars) the menu provides you with a chat box, hand stats, an area for notes, and promotion information. Intertops welcomes its new players with a strong 200% welcome bonus on your first deposit (up to $1,000). Note that this bonus is released in $5 increments and you still need to earn about 83FFP for every $5 that is released. Players who make a deposit in a given month are also invited to monthly $500 guaranteed freerolls. There are also some smaller freerolls that take place three times a day that can land you a spot in some exclusive weekly tournaments. Plenty of other interesting bonuses are to be had, including "FPP Races" that reward the top 100 poker players each week with a portion of $5,000. Rakeback is also some of the highest out there at a rate of 36%, however actually receiving this rakeback is not automatic and requires you to email a rakeback request to the Intertops staff. Note too that players receiving rakeback will earn FPPs at half the rate that non-rakeback players do. The Intertops VIP program is called Loyalty Levels and it rewards its steady players with Frequent Player Points (FPPs) that can eventually be redeemed for cash prizes. You'll earn 1FPP for every $1 you rake in for cash games and 7FPPs for every $1 you spend on tournament fees. These FPPs turn into Gold Chips at a rate of 100FPP=1 Gold Chip, which can then be traded in for cash ($5 for 20 Chips, $25 for 100, etc.). There are 50 Loyalty Levels you can climb and each level has its own set of tiers you must advance through. Completing a tier quickly can also reward you with additional Turbo Tier and Super Turbo Tier loyalty bonuses. The overwhelming majority of Intertops traffic sits below the $1/$2 tables. While the limits do go much, much higher than that, it is rare to see more than a table or two actually being occupied at those levels. Again, as Intertops is a lesser-known poker room compared to your PokerStars and PartyPokers, the competition is extremely soft especially at these lower levels. 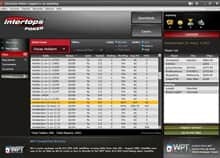 A big reason for this is that Intertops is connected to an online casino and sportsbook, meaning you'll be seeing lots of green "crossover" players stopping in to try their hand at cards. Because of the casual level of clientele, it's not a big tournament community. SNGs are rare aside from the occasional turbo games. The MTT selection is slightly better and you can find reasonably-sized NLHE guaranteed tournaments most nights of the week. The highlight of the tournament scene is the regular satellite tournaments that could qualify you for all-expenses paid trips to play in tournaments in places such as the Caribbean and Ireland. Even more amazing is that the buy-ins for these tournaments are generally extremely low. Intertops' customer support covers all the basics. Should you have a problem or dispute, you can reach their staff via email, several different country-specific phone numbers, Skype, or 24/7 live text chat. Intertops claims to answer emails within 24 hours of receipt, and the other methods come with an even faster response time. Considering its international clientele, Intertops offers a wide variety of payment methods to appeal to players based all around the world. US and Canadian players can simply use their MasterCard, VISA, or American Express card to make deposits and withdrawals. Players based outside of those two countries are able to use those options as well as some others including eWallets lie Neteller and Skrill, bank/wire transfer, and ecoPayz. We've always been impressed with Intertops' online casino brand and we're happy to report that its poker experience lives up to what we'd expect. When you're ready to give it a try, use the special CardsChat links you see here to earn the exclusive bonus. Join Intertops Poker Mobile today and double your deposit up to $1000!